Building ophthalmic nursing capacity in Liberia after the Ebola epidemic of 2014-2016. Tracy Kidder’s book Mountains Beyond Mountains, about the work of Paul Farmer, MD, in Haiti, is named after the Haitian proverb, “Beyond mountains there are mountains.” That is, as you start climbing one mountain to address a global health problem, you see more mountains or problems. In December 2017, I found myself climbing one of those mountains when I traveled to Monrovia, Liberia, to train Liberian nurses to become ophthalmic nurses. This was my 12th trip in the span of 2 years, starting during the outbreak of the Ebola epidemic of 2014 to 2016, but my first trip as a Fulbright Specialist. The Fulbright Specialist Program selects US educators and professionals from many areas, not just health care, to serve as expert consultants on curriculum, faculty development, and institutional planning for academic institutions in a country of need for periods of 2 to 6 weeks. In my case, the Fulbright grant covered my airfare, visa, and a small stipend to support my effort to establish this nursing program. Before we travel together to Liberia, however, a bit of background biography. One of my mentors at Stanford advised me to pick a career that “lets you do something for yourself, your family, your community, and the world at large.” As an ophthalmologist, that last bucket still seemed empty before 2014. Up until that time, I was busy with my solo private retina practice in Grand Blanc, Michigan. I saw 70 patients a day, operated, oversaw patients with retinopathy of prematurity in two neonatal intensive care units, participated in clinical research, and taught residents. Like many of my US colleagues, I noted a trend toward sicker patients with more comorbidities and fewer resources and with increasing difficulty accessing timely primary or subspecialty care. In 2008, my husband and I started a nonprofit organization, Red Rover Ventures, to focus on improving access to eye care locally and globally. We wanted to concentrate on three areas: research, education, and development. Our global work took us to Northern Brazil, Cambodia, and Swaziland, primarily teaching and helping to develop retina capacity. In 2012, we joined the Diabetic Retinopathy Clinical Research Network (DRCR.net) to provide our patients with additional opportunities for accessing care through clinical research opportunities. In December 2014, our practice was acquired by the University of Michigan Kellogg Eye Center with the goal of bringing cornea and glaucoma services to our community. The acquisition allowed me to make a career transition to focus on completing my MPH at Johns Hopkins University and refocus on global health and local population health. Around this time, the Ebola epidemic began to unfold in three countries in Western Africa: Guinea, Sierra Leone, and Liberia. In September 2014, one of my former residents, Debbie Gess Ristvedt, DO, now in Alexandria, Minnesota, sent me an email informing me that her grandfather, ophthalmologist Lowell Gess, MD, at age 94, had bought a ticket to Sierra Leone. She explained that the Lowell and Ruth Gess United Methodist Committee Eye Hospital, formerly the Kissy Eye Clinic, a clinic her family had run for almost 50 years in Sierra Leone, was in need of repairs, and, because Lowell understood the culture, he thought he might be of service. A few days after his arrival, another email arrived from Debbie noting that some of the Ebola survivors her father was seeing had uveitis. As images from West Africa appeared on the news, showing slums placed on military lockdown and quarantined, I questioned the public health response and wondered how a country could get into such a fragile state. Globalization suddenly meant that none of us were immune to an infectious epidemic, and memories of Robin Cook’s medical thriller Outbreak came rushing back. Civil war destroys equipment, hospitals, and clinics, and physicians subsequently lose their skills. In 2010, before the epidemic, there were 0.1 physicians for every 1,000 Liberians compared with 1.1 doctors for every 1,000 Americans.2 The goal of the World Health Organization’s Vision 2020 project is for there to be one surgical ophthalmologist per 250,000 population by 2020.3 There is no accredited surgical ophthalmologist yet in Liberia, for a population of 4.3 million people. The busiest ophthalmic surgeon is a cataract surgeon who performs about 1,000 cases per year. In late 2015, I found myself drawn to West Africa. One of those mountains from the Haitian proverb seemed to be right in front of me. I just wasn’t sure how I would get there. With my husband’s support, we put our home up for sale in Ann Arbor. Rachel J. Bishop, MD, MPH, at the National Eye Institute, and Allen O. Eghrari, MD, at Wilmer Eye Hospital, had posted a request on the American Academy of Ophthalmology’s website for ophthalmologists to work at the PREVAIL clinical research eye clinic in Liberia. I responded right away. The first mountain—how to get there and learn the ways of the mountain—seemed ready for climbing. Substudies of PREVAIL III are focused on the ophthalmologic complications of EVD, which include uveitis and complicated cataracts. These complications raise issues of medical and surgical capacity to provide eye care to EVD survivors. Most of my trips to Liberia have involved clinical research and the ophthalmologic evaluation of Ebola survivors and their close contacts as part of longitudinal and cataract surgical trials. 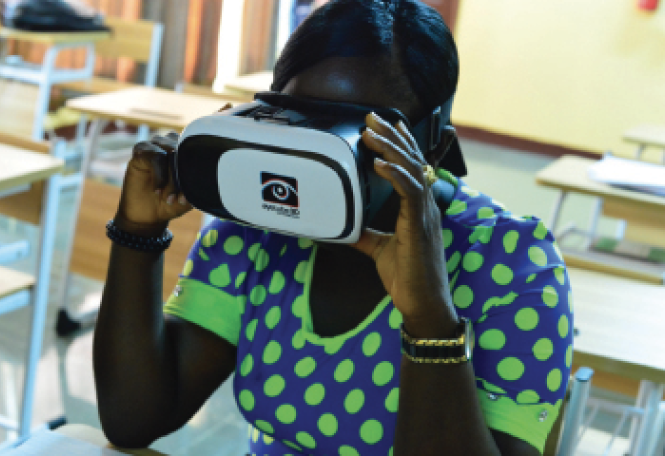 The PREVAIL III eye substudy investigators partner with Liberian ophthalmic technicians, ophthalmologists, and cataract surgeons to evaluate participants. At the same time, we teach how to use the slit lamp, indirect ophthalmoscope, and optical coherence tomography. The hopes are to build future research capacity, to train eye care professionals, and to build diagnostic capabilities. Our PREVAIL ophthalmology team partners with other stakeholders and institutions to collaborate and build eye care capacity, including clinical research. In September, the PREVAIL investigators partnered with nine institutions (see sidebar below) in four countries (United States, Kenya, India, and Liberia) to undertake PREVAIL VII, a surgical safety study on Ebola survivors.5 This was an opportunity for us to partner with a team from Emory University, which consisted of Steven Yeh, MD; Jessica Shantha, MD; and Brent R. Hayek, MD, who had worked with Dr. Gess in Sierra Leone, and with US surgeons Benjamin W. Roberts, MD, and Daniel L. Gradin, MD. This effort also brought great hope that surgical capability would one day become a reality for Liberia. L.V. Prasad Eye Institute has partnered with the Liberian Ministry of Health and John F. Kennedy Hospital to start an ophthalmology residency program in Liberia. Because it will be years before the first ophthalmologists complete their training, the collaborative international community continues to train all levels of eye care personnel. Our PREVAIL collaborators also train physician assistants to test visual acuity and manage dry eyes, sun damage, and presbyopia as part of primary eye care screening. Figure 1. Three students practice using a smartphone. Figure 2. Ophthalmic nursing student Samira G. Attobrah watches her first pars plana vitrectomy in 3D at the New Sight Eye Center. Figure 3. Dr. Ross (in blue) celebrated with her ophthalmic students on her last day of class. Left to right: Caroline Nyanama, Botoe L. Karnley, Woiyea Dorbor, Amanda M. Mathies, Dr. Ross, Samira G. Attobah, Helena A. Tarnue, and F. Kolu Mulbah Kamah. Dr. Bishop of the National Eye Institute and Marie Diener-West, PhD, of Johns Hopkins Bloomberg School of Public Health supported my application for the Fulbright Specialist Program in Liberia, which was accepted in 2016. The Fulbright Specialist Program allows grantees to share their expertise, engage in cultural exchange, and help to strengthen institutions. The Bureau of Educational and Cultural Affairs of the US Department of State established the Fulbright Specialist Program in 2001, and it is active in 150 countries. I will have the opportunity to return again this year under the program. 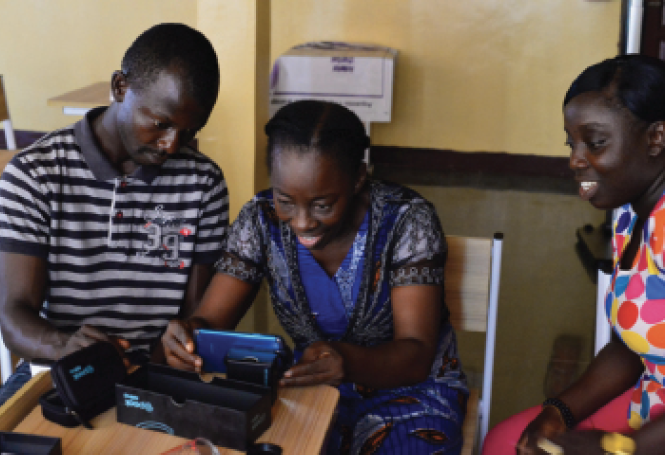 Our work on the program takes place at the New Sight Eye Center in Monrovia. 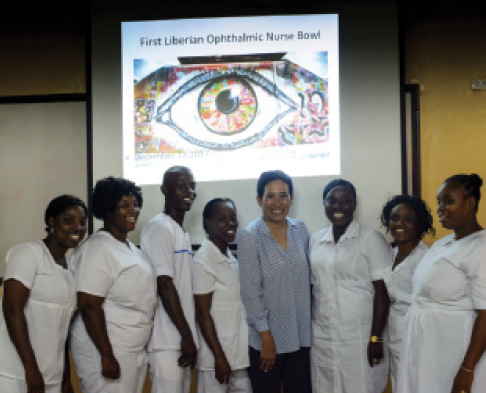 The center was founded and directed by the busiest cataract surgeon in Liberia, Robert F. Dolo, RN, who built and developed a nursing curriculum that was approved by the local Liberian nursing board in October 2017. As I noted at the outset, my task was to support curriculum development and to train Liberian nurses to become ophthalmic nurses. Each nurse who participated in the program took a year off from his or her host institution to focus on ophthalmology training. All of the nurses shared stories of working in Ebola treatment units. Seeing people survive Ebola but then lose vision served as motivation to join the program, with the hope of bringing ophthalmic care and surgery to their own facilities. Station No. 1. Visual acuity. Students learned to check visual acuity using a smartphone loaded with a free visual acuity tester app. Station No. 2. Testing. Participants learned to use a free app to perform Amsler grid, color plate, and pediatric fixation target testing (Figure 1). Station No. 3. Anatomy viewing. Students got a look at pupils, eye movements, and orbits using a free smartphone app. Station No. 4. Direct ophthalmoscopy. We used a simulation eye to teach direct ophthalmoscopy and to understand the importance of the red reflex. Students then transitioned to smartphone–based vision screening at the same station. Station No. 5. Surgical videos in 3D. 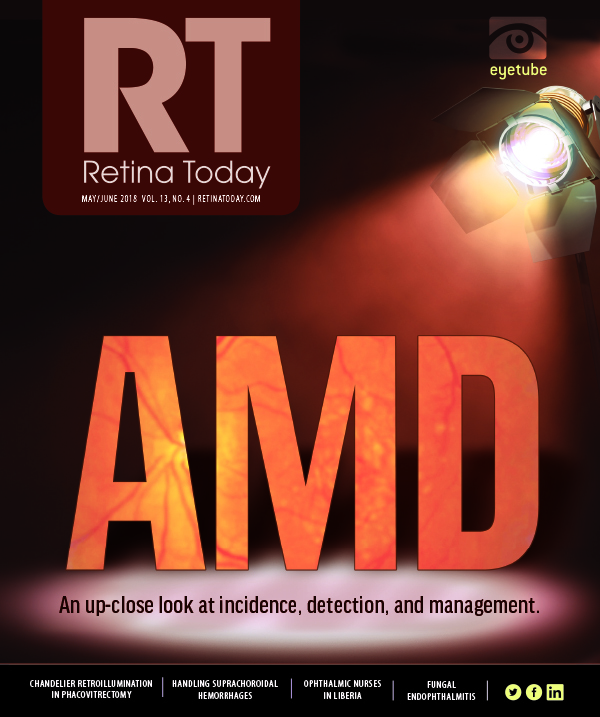 Nurses viewed their first vitreoretinal cases in 3D on Eyetube.net. They were mesmerized (Figure 2). “Can I watch another?” High fives for Station 5. We could not get them to leave. Station No. 6. Portable slit lamp station. To add practical application to a PowerPoint lecture on slit lamp that incorporated snippets of the videos of Timothy Root, MD, we challenged the students’ dexterity. Getting the cornea, anterior chamber, and pupil in focus for the first time left them giddy. Station No. 7. Body mass index (BMI) calculator. Our last station served to refocus the students with a review of systems and the connection of general health to ophthalmology. At that last station, we taught how to measure BMI. In the US, no student would want to volunteer to be weighed or measured, but everyone in this class volunteered to use the National Institutes of Health BMI calculator app on our smartphone. This helped the students to weigh their future prospects of diabetes and hypertension and consider the potential effects on their vision. The students reported that they see too many patients with diabetes and high blood pressure that are not being addressed. When I am not working in Liberia, I am Director of Global Outreach at the University of Arizona College of Medicine – Phoenix. I teach first-year medical students global health, and we travel to the Dominican Republic with volunteer primary care faculty who set up a clinic adjacent to an orphanage. As an ophthalmologist, my hope is to influence the shrinking real estate map of ophthalmology in medical education. Global health offers a unique humanitarian setting for ophthalmology to reengage with primary care. 1. The Ebola Epidemic in West Africa: Proceedings of a Workshop. Washington, DC: National Academies Press (US); 2016. 2. Physicians (per 1,000 people). The World Bank. https://data.worldbank.org/indicator/SH.MED.PHYS.ZS?end=2010&start=2010. Accessed April 18, 2018. 3. Strategic plan for Vision 2020: the right to sight. World Health Organization. http://apps.who.int/iris/bitstream/handle/10665/205924/B1467.pdf?sequence=1&isAllowed=y. Accessed April 18, 2018. 4. Study of Ebola Survivors Opens in Liberia [press release]. National Institute of Allergy and Infectious Diseases. June 17, 2015. www.niaid.nih.gov/news-events/study-ebola-survivors-opens-liberia. Accessed April 11, 2018. 5. PREVAIL II: persistence of Ebola virus in aqueous humor and outcomes of cataract surgery in survivors of Ebola virus disease. Clinicaltrials.gov. https://clinicaltrials.gov/ct2/show/NCT03309020. Updated April 18, 2018. Accessed April 18, 2018.